Welcome to the Artisan Design Team Blog Hop. You may have just arrived here from my lovely friend Kimberly Van Diepen from the US - I am in love with her project. 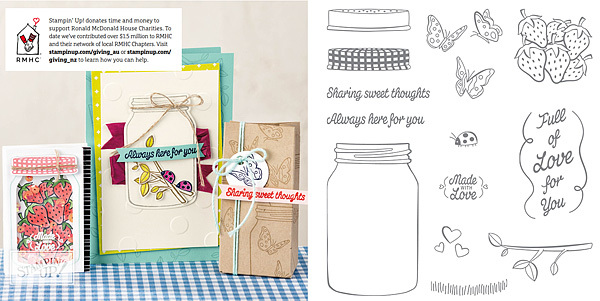 Today the Artisan Design Team are highlighting the lovely Sharing Sweet Thoughts stamp set from page 233 of the Annual Catalogue. This stamp set helps support the Ronald McDonald House Charities all over the world and in monies stay in the same market where you purchased your stamp set. 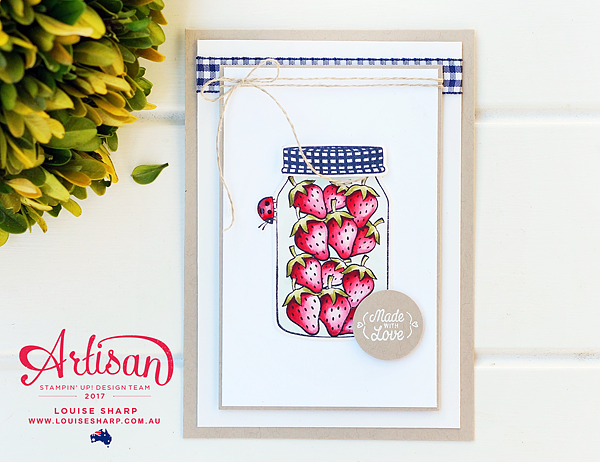 If you purchase this set in Australia, Stampin' Up! will donate $3 from every set sold to a RMHC within Australia - pretty cool....I love this company! 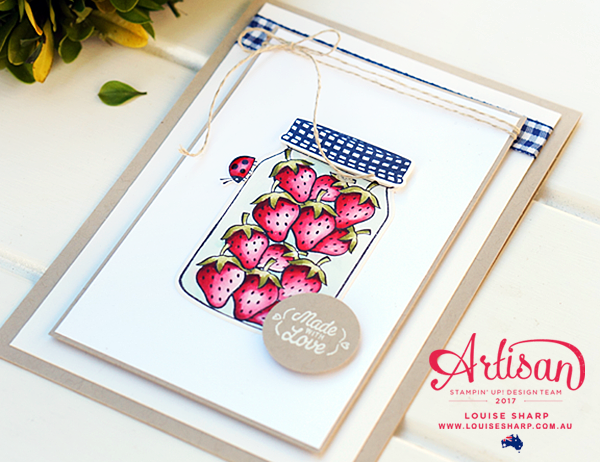 The Stamp-a-ma-jig is a fabulous tool and a staple item in my craftroom and I used it to line up the strawberries perfectly in the jar. I used the coordinating Everyday Jar Framelits to cut the jar and the lid. The new Gingham Ribbon in Night of Navy coordinated with the lid of the jar and I will admit to really liking how this card came together! The strawberries were coloured with a Stampin' Write Marker in Real Red and Old Olive using a Blender Pen. Next on the hop is my talented friend Maike Ulbrich from Germany. I am always so inspired by her. If you live in Australia I would love to be your demonstrator! You can click on any of the items below and purchase them from my ONLINE SHOP: JUNE HOSTESS CODE: J6PE3S4H.